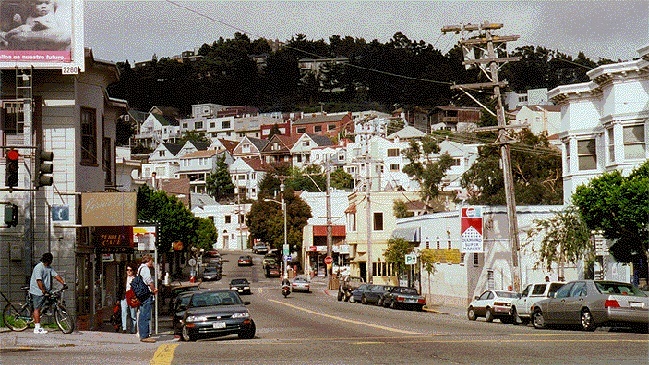 Diamond Street heading north, mid-1990s. Neighborhood historians cite two occurrences that affected the character of Glen Park: the introduction of Joost's electric railway in 1892 and the earthquake of 1906. Like other parts of Rancho San Miguel, Glen Park began as ranch land. Jose Noe's cattle roamed Glen Park's hills and valleys and very likely found protection from sudden bad weather in the corridors of the rustic Glen Canyon. Farms sprang up--dairy farms, duck farms, pig farms. After Joost's electric car line began, light industry settled in Pacific Coast Basket Factory (Weller and Carrie Streets): John Houold Tannery (Bosworth near Arlington); artificial flower company; shoe factory (100 block of Joost Ave.); Ray Oil Burner Company (San Jose Ave.) etc. Gradually, the word about the natural beauty of Glen Park's land reached wealthy downtown people. They built weekend vacation houses in Glen Park and it slowly gained another name--"Switzerland." From April to October "Switzerland" was a lively weekend resort: Sunday picnics with bowling, wrestling exhibitions, dancing. Large crowds came to watch hot air balloon ascensions and tight rope walks across the sky of the canyon. There was a Morro Castle complete with a moat and a tea house. Prior to the electric railway in 1892, a trip downtown meant a walk to Cortland and Mission Streets to board a horsedrawn car. Joost's new streetcar changed that overnight. 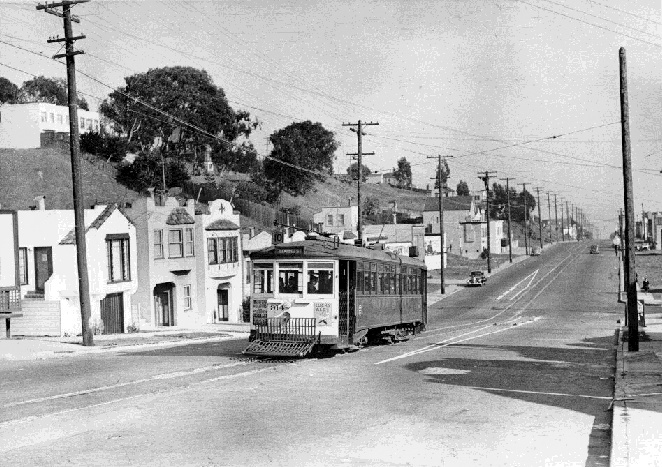 Cars ran from 30th Street to San Jose Avenue to Sunnyside Avenue (now Monterey Blvd. ), Circular Avenue and Baden Street. The Power House and Car Barn were on that block. The 10-Line streetcar #914 trundles along Monterey Blvd. near Edna ca. 1940. Same view, Monterey at Edna, December 2018. Joost built the Diamond Street Bridge or trestle (from Chenery St. to Bosworth) over the creek flowing from Portola to the present day Silver Tree Day Camp. A little electric street car called the "toonerville trolley' ran on Bosworth from Mission to Glen Park daily to 7 p.m. On Sunday another one ran on Chenery Street west from Diamond to the Glen Park Picnic Grounds. The 5 cent fare with transfer paid for good and reliable service. An 8 a.m. streetcar took 15 minutes to the Ferry Building in time for 9 a.m. boats to Oakland or Sausalito. The 1906 earthquake sent refugees scrambling to the outside lands for safety. Like other Rancho San Miguel neighborhoods, Glen Park suffered less earthquake damage than downtown. Residents freely opened their homes to refugees. The present day Glen Park playground became a city of tents. The streetcar passenger waiting house at Castro and Chenery Streets sheltered the homeless. Each day people waited in front of the relief station at the old shoe factory: one day for bread, another for meat etc. By July stores reopened, people returned to work and to their homes when they passed militia inspection. 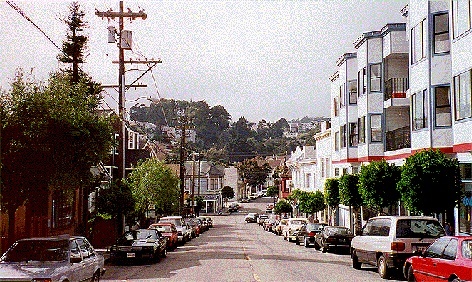 Many refugees won over by friendly villagers and impressed by the seismic safety of the area, chose to remain in Glen Park. The Examiner in October, 1906, advertised Glen Park Terrace Homes: lots from $500 upwards, 10% per casa, $10 per month. To this day, some residents of Glen Park are children of the 1906 earthquake settlers. 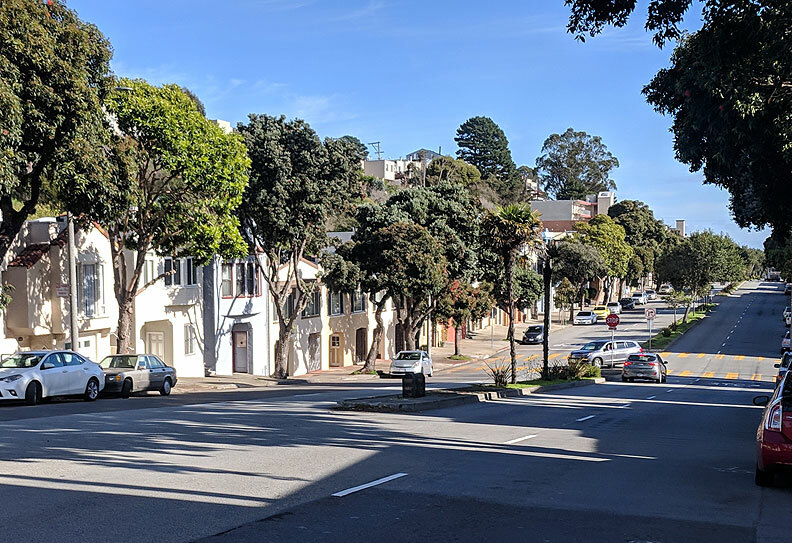 Historically, Glen Park residents have keenly appreciated the spectacular beauty of their "Switzerland" and took steps legislatively to have certain areas declared as protected open spaces. With the recent advent of the BART station in Glen Park came the possibility of another spurt of dense growth in the neighborhood. Various neighborhood groups are constantly alert to traffic, population and building changes. Their great challenge (and the city's) is to maintain the quality of living in this very charming village and stand guard to protect and preserve San Francisco's "Switzerland" for future generations. Chenery Street heading west, mid-1990s.